Since yesterday’s post on women’s wear basics for the warmer months I’ve given the same thought to our wardrobes. Men have traditionally switched to lighter fabrics in summer. That’s about it. Lighter colours, lighter fabrics. Got through your closets and get the following ready to ship out. 1) Flat front chinos. “Chinos” are those khakis with a bit of a polished sheen to them. They are lighter in weight (6 oz.?) and a classic. To cuff or not to cuff? Whatever you prefer. Even the Europeans are rolling up their khakis to show some (sockless) ankle — which makes it look like they’re wearing sloppily cuffed trousers. Wear them with a long-sleeved shirt (sleeves rolled up), your Sperry Stripers and a polo shirt, or a black tennis shirt and black loafers for a casual evening out. 4) Seersucker suit. Again, the pieces can be worn separately with khaki or white trousers and a white button-down or tennis shirt, respectively. Choose a dark knit tie or linen matte tie with a white shirt to give it a more serious look than the traditional white button-down and bowtie with white bucks combination. 5) Striped shirt. Either a fisherman’s shirt like the ones Picasso so famously wore or a t-shirt to layer or wear to very casual events with shorts. 6) Suede loafers (unlined). I never stick to them, even when I don’t pour in the foot powder. Tan or lighter colours are best (unless you can pull off the bright coloured driving shoes like the Italians.) Or a good pair of highly polished penny loafers or bit loafers. 7) A ribbon, needlepoint or surcingle belt. Something with some colour to it. Or brown alligator. 8 ) A colourful shirt. I have an orange linen one that looks great with a tan and my white jeans. 9) Striped espadrilles… or Sperry canvas deck shoes (“Stripers”). For casual wear, they can’t be beat and look great. 11) Linen drawstring pants. For vacation or lounging around the house. Mine are blue or khaki. Too, too for you? Natural or white linen jeans. 12) Great sunglasses. Classic aviators, tortoiseshell wayfarers, Persols…. 13) A straw hat. In a classic style and in whatever condition to use at outdoor events at high noon or at the beach. I don’t like the wide-brimmed golfing version that crops up all over. I’d rather see one of those huge lifeguard versions or a plantation sized brim on an optima crown, even. 14) A bandana in a bright colour. For use as a neckerchief or a pocketsquare or a picnic cloth. 16) A brightly coloured sweater. Lime green, orange, red, yellow… but make it lightweight. 17) A light tie. Yellow, pink, lime green or light blue. Whatever takes your fancy. To wear with your business greys and blues. 19) Gold Bond body powder. It works. It keeps you cool. And, if you want to channel our man in the photo above, please do. Spectator shoes (white trousers, jackets and bucks) are traditionally worn from Memorial Day to Labor Day in the States (or year-round in tropical climes.) You can’t go wrong with a linen blazer or light coloured odd jacket in a fresco cloth. Don’t forget your white DJ. This entry was posted in Uncategorized and tagged spring and summer clothing. Bookmark the permalink. But Elegantologist….I already have 100% of the items on your list. Funds are scant so what then, might I procure nominally, to feel as if my summer closet swap-out has some zing? Hello ADG, that’s the point. As with yesterday’s list, it’s an effort to show that new clothes aren’t needed to stay in style. If you are hankerin’ for something new, I recommend bright pocketsquares, a new MTM/Bespoke shirt in a bright stripe, a new pair of shoes … or save the funds and head for a vacation (in a convertible.) Even the white linen suit? Good man! I have most all of these items but the striped espadrilles. I like them but have never seen them at any retailer. Perhaps I am not looking in the right places. Where can I find a pair and what color combo do you find most versatile? ADG, do you own a dove grey suit? Or light grey at any rate? Hmm, I might have to do a second tier list for business. Beyond the basics. Are you trying to distract me with that photograph? E. Yes….please do a beyond the basics list for those of us who have closet contents beyond good measure and restraint. That would be fun. Thanks for the advice. Indeed, I did grab a couple of Flusser socks and a new pocket square recently. The other thing that I’ve found for cash flow challenged folks like me is a great offering of horizontal striped socks at J. Crew. I don’t have a dove grey suit but let me tell you…I just saw a dupioni (sp) silk swatch in dove grey that was fetching. I suppose the need for frugality forced people to think a little more about what they already had. EAEL, has mentioned a few combinations that are quite rakish if you can make them work. Color, tonality, fit, season, creativity, all come into the equation…This is a great opp to take what you have, and figure out new looks. For example, in my hey dey, I bought a rather expensive hand made cream linen suit. As a suit, I’ve worn it less than half a dozen times in ten years. One day, I got fed up with looking like a banana republic drug lord, but I had to wear the suit somehow. Breaking it up, mixing it up, trying, testing and sometimes succeeding, I still get great use out of that suit after ten years. That’s the tough part about being elegant. Looking great with anything you already have is a real art. Maybe we can develop a personal elegance only through tough choices. Maybe you can show us some mixes you prefer? Oh my Cary! 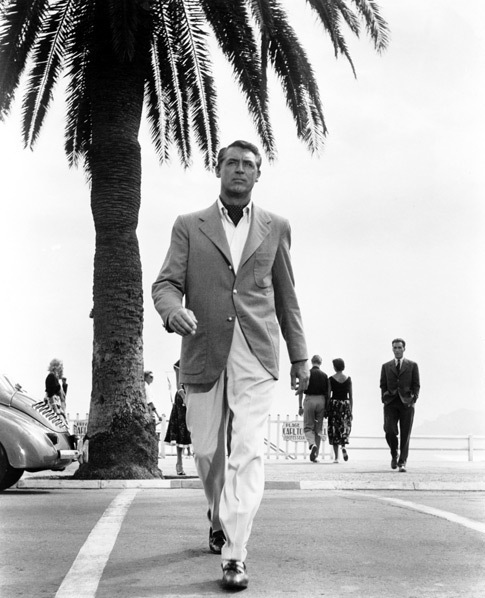 He set the stage for best dressed men forever. What about swimwear? As the defacto manager of my beloved (and color-blind) husband’s closet, I’ve gone in and shuffled warm weather items forward. In doing so, I noticed that his trunks need replacement. Any suggestions? thanks! Love the blog! And that pic of Grant from TO CATCH…is now my favorite pic of him. It used to be the one of him under the scaffolding, holding an umbrella and looking out at the street but this one tops it for saviore faire. iCG, couldn’t have put it better myself. Trish, last summer I bought a suit from Brooks Brothers that had no elastic waistband (http://easyandelegantlife.com/2008/06/24/sea-legs/). It was perfect. Birdwell Beach Britches function the same way and are very flattering. Thank you so much for this; this is a terrific inspiration for year ’round here in very sunny Los Angeles, which was, of course, Cary Grant’s home too (people forget). I’m bookmarking this for easy inspiration when I’m feeling more easy and less elegant! A perfect list for the forthcoming season. Love the list. I dress my husband and seriously sometimes I’m just baffled on how to change his look. Gracias!